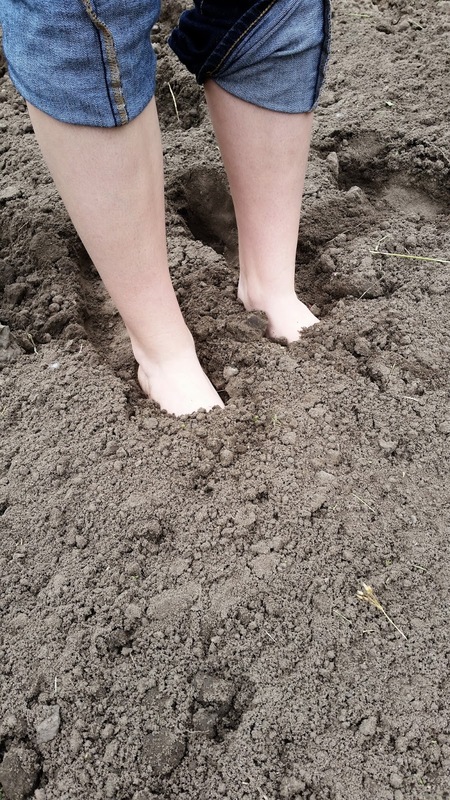 ►As we were planting yesterday one of my daughter's came out barefoot and asked if I'd ever walked in the garden barefoot? She was loving it. Of course this part of the garden is very sandy so it is nice and soft. I'm pretty sure I've never gone barefoot this deep in the dirt. I'd like to say that I just kicked off my shoes and joined her and how wonderful it was feeling the earth squish between my toes....but, instead I said I didn't want to have to clean the dirt out of my toe nails and that I'm not a big fan of barefoot. How stodgy I must be. I wear shoes or slippers all of the time even in the house. I feel empowered and ready to work with shoes on! How about all of you? Would you have kicked off your shoes and joined her? 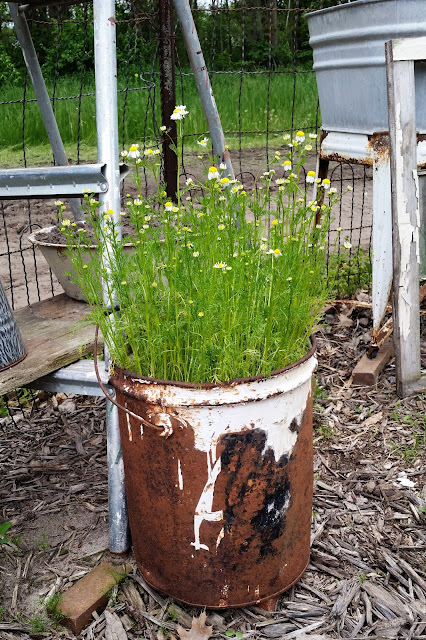 ► The chamomile is blooming! ►Our late blooming lilac bush is also blooming. So nice to get another few blooms to scent the room. 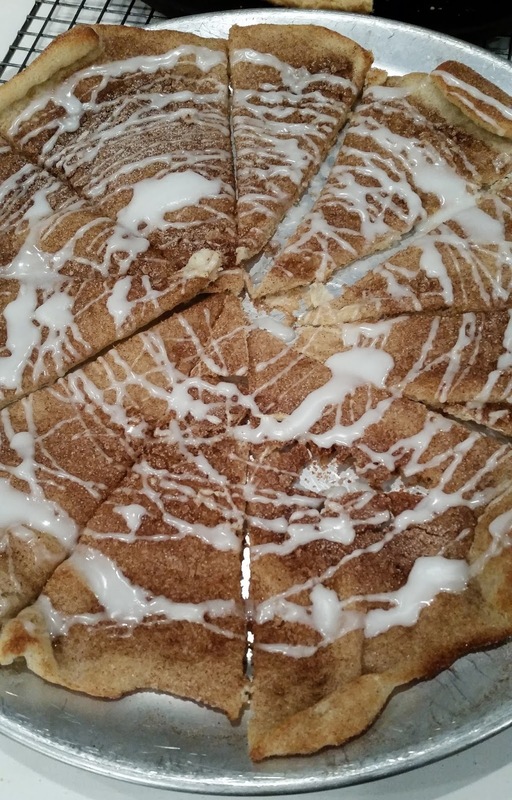 ►Easy dessert idea for you: A refrigerated pizza crust rolled out on the pan, sprinkled with cinnamon sugar baked according the the crust instructions. Then drizzle it with a simple powdered sugar glaze. Fast and pretty tasty. A ratio of about 1/4 c sugar to 1 T cinnamon works well. But, adjust to your tastes. ►FlorLarios has 50% off in her Etsy shop this weekend: Use code HAPPY50 I have purchased a lot of her wood blocks and stickers. I have them in my home and have given many as gifts. Her art moves me. ►We celebrate Memorial Day here in the USA this weekend. It makes me emotional when I think of the sacrifices that have been made. My Mom can recall the story of what they were doing when the news came on the radio that Pearl Harbor was bombed. If you have a chance to hear the retelling of the war stories of "back in the day" you've been given a gift. My daughter and I were both saying that we almost always garden barefoot. I live on the beach and the first thing I do when I get there is kick off my shoes. I am always barefoot in the house. We leave our shoes out side of the front door otherwise the house would be filled with sand...especially in the summer time. I go barefoot as often as I can and never wear shoes in the house. I love the feel of grass and soft dirt and sand on my feet. The dessert pizza idea sounds yummy. 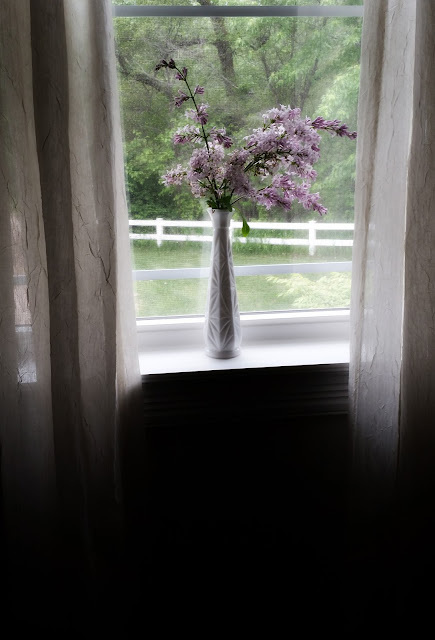 Your lilacs are beautiful! Yes, I would have squished my toes in the garden. :) I really don't like to wear shoes. I wish I lived where it was warmer so I could wear flip flops year round. I love your "tank garden" and your sewing room/studio. I enjoyed browsing through your blog. P.S. Thanks for visiting and leaving a comment on my blog.